Using the familiar "blood splat" effect that featured on the previous tour, this is a nice addition to the collections. I must say when I first saw one it did remind me of a certain Mr Dave Webb, saxophone player on a previous tour of Rocky that used to play on stage at the start of the second act, complete with bandana. 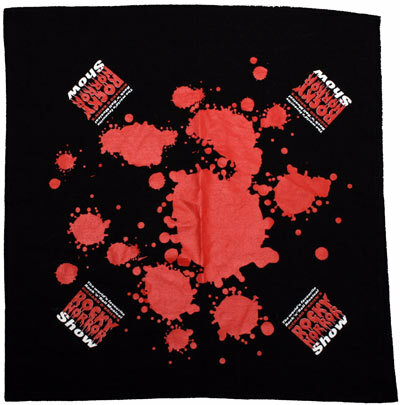 Currently only available to buy at the Rocky Horror UK stage show venues during performances, the Bandanas are £8 each.